Users of telnet, rlogin, and ftp may not realize that their password is transmitted across the Internet unencrypted, but it is. OpenSSH encrypts all traffic (including passwords) to effectively eliminate eavesdropping, connection hijacking, and other attacks. Additionally, OpenSSH provides secure tunneling capabilities and several authentication methods, and supports all SSH protocol versions. Another great feature about OpenSSH is the Public Key Authentication mechanism. With this feature enabled you are able to securely authenticate to servers with out typing in a password. This tutorial will assume that you meet the requirements listed below. I will use Fedora Core 3 in this tutorial so if you are using something different your file paths may differ. This can be accomplished on either a server or a client. If you do not have access to the server you will have to send your public key file to someone that does and have them import it for you. Open a Terminal and ensure you are in your home directory. To confirm this your prompt should look something like this [user@computer.ext ~]#. -b bits     Number of bits in the key to create. -c          Change comment in private and public key files. -e          Convert OpenSSH to IETF SECSH key file. -f filename Filename of the key file. -g          Use generic DNS resource record format. -i          Convert IETF SECSH to OpenSSH key file. -l          Show fingerprint of key file. -p          Change passphrase of private key file. -y          Read private key file and print public key. -t type     Specify type of key to create. -B          Show bubblebabble digest of key file. -C comment  Provide new comment. -N phrase   Provide new passphrase. -P phrase   Provide old passphrase. -r hostname Print DNS resource record. In this tutorial I will use a key type of DSA you are welcome to explore the different types but for my needs DSA is more than capable. You will be prompted to enter a passphrase THIS IS IMPORTANT!!! If you forget your passphrase the key pair is lost forever please choose a passphrase you will not forget! If you are on a client you can move the public key file into your user directory and when it is to be transfered to the server you will know where to find it. It is also possible to do this on a Windows compatible OS using PuTTYgen. Ensure that the last 3 parameters are set like above and then save your changes. Since root is the most powerful user it will be used in this tutorial. if you wish to enable authentication for another user follow these steps and replace root with the desired username. Return back to your home directory and check to see if you have a file named authorized_keys in sub-directory called .ssh. Now add the public key to the authorized_keys file. This may seem easy but it is the most common place for error. If you miss copy one character it will not authenticate you. To prevent any errros cat the contents of your public key (<filename>.pub) to the authorized_keys file. Should you be in a situation where you have to copy and paste the key from one server to another insure that the key file looks identical to the original. This will save you many hours of troubleshooting as there is no log entry telling you the public key was copied incorrectly. -c          Generate C-shell commands on stdout. -s          Generate Bourne shell commands on stdout. -k          Kill the current agent. -a socket   Bind agent socket to given name. -t life     Default identity lifetime (seconds). -l          List fingerprints of all identities. -L          List public key parameters of all identities. -t life     Set lifetime (in seconds) when adding identities. By default ssh-add will look in the identity file for you private keys. Now you are ready to connect to the remote server with your private key. Install the SSH-Agent you downloaded from the requirements section. You will have to launch the application and configure some settings before it is ready for use. Click on View from the menu and select Show SSH Identities. Find your identity file and ensure Default is checked. 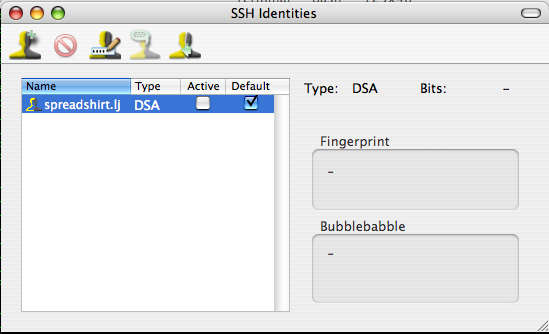 Next select SSH Agent from the menu and choose Preferences. Ensure that Activate Default Identities is enabled when launched. Close SSH-Agent. It may be useful to have on the dock, this way you can easily activate keys by simply clicking once and entering your passphrase. Launch SSH-Agent one last time and it should prompt you for your passphrase and activate your ID. Once this is completed you can close the identities window and test your connection with the open terminal window. It is also possible to do this on a Windows compatible OS using PuTTY and Pagent. Secure Copy (SCP) - An alternative to FTP and SFTP. This page was last modified 21:55, 22 August 2015. This page has been accessed 261,521 times.